Now....I'll be the first one to admit that I don't play Sandbox games and I avoided Minecraft like the plague because I never really got interested in it nor did I see why it became so popular. Although albeit that, I'll be making a T&H Thread for Minecraft for those that are new and want information on how to play the game AND for expert players to submit their suggestions so that others and Phil may have a better time at playing the game. Now all the tips I'm putting in initially are thx to Bushidoah19. 1. Don't stay out at night to gather supplies; you will probably die. 2. The best way to kill creepers is to hit them with a sword, then run backward away from them, when they stop hissing repeat that process. 3. Most important items are wood(for building etc) torches(for lighting and mining) and tools(like swords, pickaxes etc). Before going to mine always bring torches, spare food, a chest and spare tools (just incase your tools wear out and break which happens often will lower level tools). I'd advise anyone to place all the torches on one side of the cave, right or left is your choice, that way you can follow them back out by just putting them on the other side of you. 4. 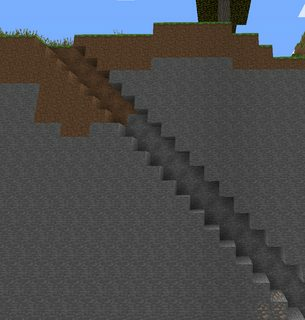 Never dig straight down, not because you could fall out of the world but because you could break into a pocket of lava or a ravine, fall into it and die, losing all your stuff. 5. Make sure you always have a shelter even on your first night. 7. To sleep and progress from night to day in the game, you must make a bed, you'll need 3 wool blocks and 3 wood block, you can obtain wool by killing sheep (you can use your hands as well as a weapon) and they usually drop 1 wool block per sheep. 8. You take fall damage. 9. You don't gain health by eating food, you gain hunger. When you're above 7 bars of hunger you can sprint and you regenerate health automatically. 10. Eating food raw will only give you a little bit of hunger and make you feel weird, you must cook the food to get the full reward. 11. You can cook food by placing it in the top box of a furnace and by placing coal (which you can get from mining) or wood planks. 12. Do not allow Sand or Gravel fall on you. If you're covered with too much Gravel, you'll slowly suffocate and lose Health. 13. For anyone wanting to start farms: Cows and Sheep are bred with wheat, Chickens are bred with seeds, Pigs are bred with carrots, Rabbits are bred with Carrots or Dandelions (yellow flowers). 14. You can tame Wolves by right clicking them with bones and Ocelots by right clicking them with fish. 15. You can make an infinite water source by a 2x2x1 hole in the ground and right clicking buckets of water on opposing corners. 19. Bring stacks on Cobblestone with you when you go into the Nether to protect yourself from Ghasts. If in an open area try to get away from the Nether Portal as quick as possible otherwise a Ghast may blow up your only way out of the Nether. Cover the Nether Portal with Cobblestone to protect it if Ghast are in the distance. 20. When high up or trying to build, crouch to avoid falling of the edge of the block you're standing on. As long as you crouch your character wont fall of the side because an invisible wall will prevent you from falling. 22. When you're in a chest, hold shift and click on items in your inventory to move the entire stack straight to the chest or viceversa. Makes moving items back and forth super fast. 24. When you're holding a stack of items in your inventory screen, right click to place one at a time. 1. Bushidoah19- Helped initially with the first 12 tips. 4. Xephyr22- Help update some of the previous tips. 7. Icured - Thx for the detail explanation on Max PC Usage for Minecraft + More! hope Phil doesnt see this at first, he should learn how to play a game on his own, imo. This is for everyone that is interested, not just Phil. Although is better if he DID see this because you know how he'll get if he doesn't understand something right. But do you have any tips you can share? ​yes whatever Phil does let sand and Gravel fall on you, i mean don't let it. ​you get hurt if you let gravel or sand fall on you. ​If you get covered by too much gravel (unlikely, but still) you'll start to suffocate and gradually lose health. Page updated. Thank you Dark and Silent. That way he could keep it open somewhere and look at it whenever he needs it. ​That's great Cless but the downside I see fro​m that is that you wouldn't know what those ingredients are unless you seen them before. It doesn't give you a name when you mouse over it. I'm going to update some of these because they're either incorrect or seem to be for an older version of minecraft than is current. 5. 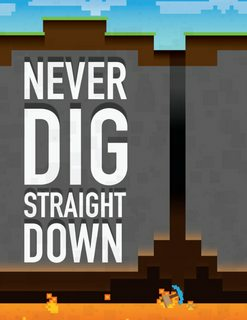 Never dig straight down, not because you could fall out of the world but because you could break into a pocket of lava or a ravine, fall into it and die, losing all your stuff. 10. You don't gain health by eating food, you gain hunger. When you're above 7 bars of hunger you can sprint and you regenerate health automatically. 11. The only downside to eating raw food is that you gain less hunger from it. I recommend you make sure to use the 64 bit version of Java for minecraft as it will allow minecraft to utilize as much of your computing power as possible. Go into the video settings in game and change the render distance to “far”. If the pictured message (below) doesn’t appear then it is likely you already have the latest update installed. After you start a game press escape and click resource packs. 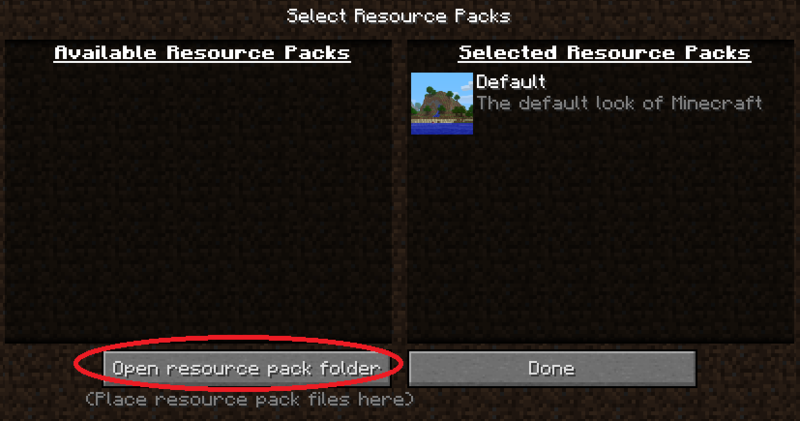 Click open resource pack folder. 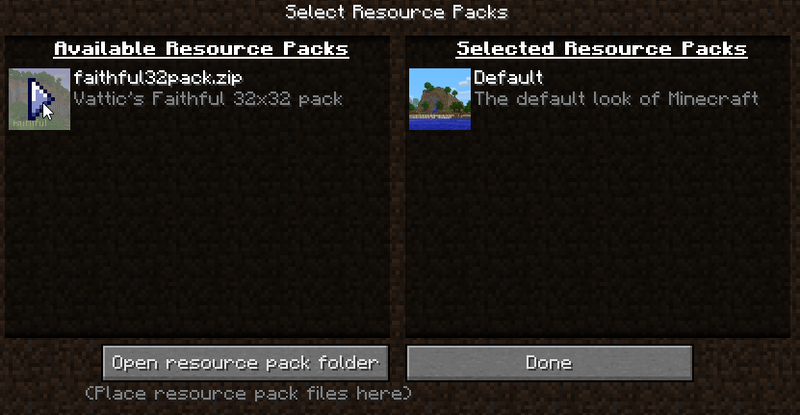 A windows folder called resourcepacks will open, place the zip or rar texture pack file into the folder. 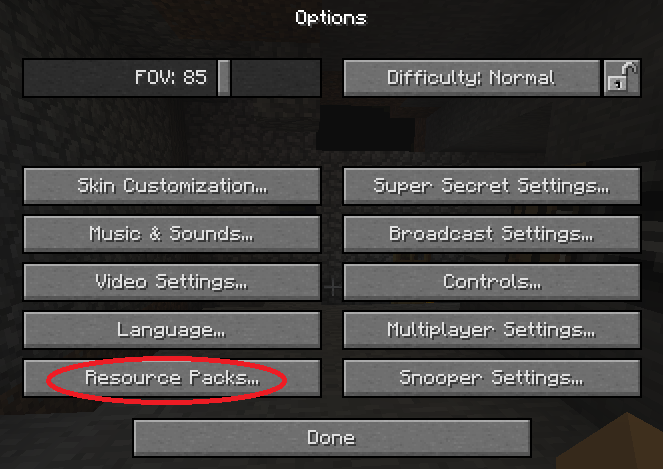 When you go back to the game you should see the texture pack in the left column, left click it and it will move to the right column. 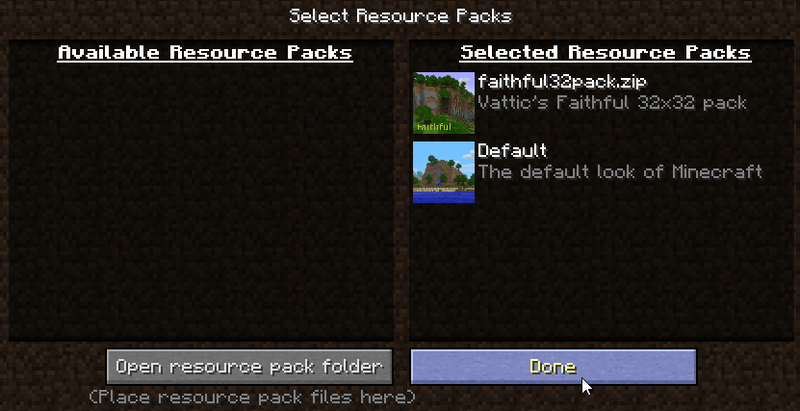 (Texture pack now on the right column) Click done. 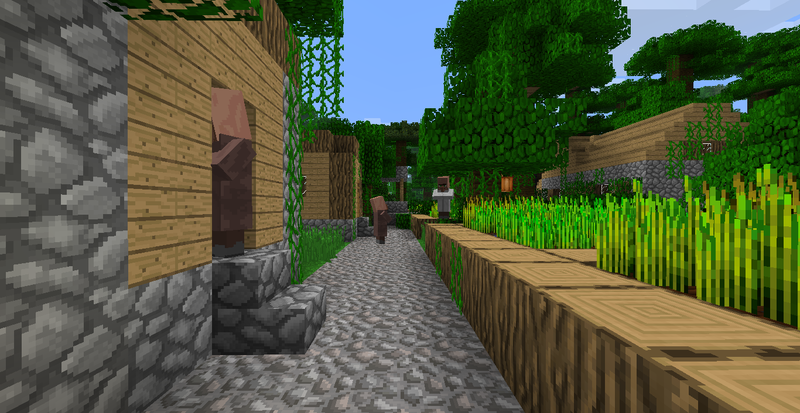 Note: If you are using a high res texture pack you may need to wait a bit for it to load. Thanks for updating the incorrect info, I haven't played Minecraft in a while so my memory of it is a bit dusty. Bring stacks on Cobblestone with you when you go into the Nether to protect yourself from Ghasts. If in an open area try to get away from the Nether Portal as quick as possible otherwise a Ghast may blow up your only way out of the Nether. Cover the Nether Portal with Cobblestone to protect it if Ghast are in the distance. When high up or trying to build, crouch to avoid falling of the edge of the block you're standing on. As long as you crouch your character wont fall of the side because an invisible wall will prevent you from falling. Page updated. Thank you all who contributed. 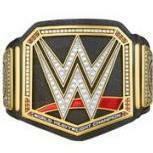 Creds have been passed. 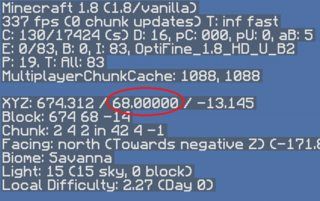 I think getting either Optifine or MCPatcher would also help boost the performance of the game too. Turn off clouds, Turn off Fancy Graphics, and particles will increase FPS and better performance. Since I normally get 30 fps playing on amplifeid Terrain I now get 60 FPS thanks too it. Mind u playing on a laptop. Dunno if it was mentioned, but you gotta double tap forward twice to run/sprint in this game. On PC it would be the W key two times quickly, and running causes your hunger to drop more rapidly. Holding shift just causes you to crouch, which will stop you from falling off the edge of a block as long as you're holding it(if you're at the edge of a cliff). Played it recently and it seems they fixed a ton of performance issues and it's very well optimized now. ​Nope, they added a sprint button. You can just hold down Ctrl to sprint now. Of course you can also rebind every key on the PC version to your liking. Why you shouldn't dig straight down. How I recommend you dig down. 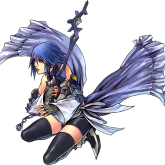 Altitude is commonly expressed as a number defining the distance in layers above the base of the game environment, which is layer zero (0). Sea level is recognized as layer 62 (i.e. altitude 63), and the top of the game environment is layer 255 (i.e. altitude 256). Clouds appear halfway between the two at layer 127. Resources by altitude and tools needed to gather them. Don't kill all the animals in a given area because if you do they won't regenerate in that area (except squid). To increase the animal population you need to breed them, you do that by feeding two of the same animal when they are near each other. Not sure if it was mentioned, but there are item management shortcuts. You can quickly move entire stacks, auto craft, place single items, etc. When you're in a chest, hold shift and click on items in your inventory to move the entire stack straight to the chest or viceversa. Makes moving items back and forth super fast. When crafting items, point your mouse over the item you wish to craft and shift click to create as many as possible with the resources in the crafting table. When you're holding a stack of items in your inventory screen, right click to place one at a time. List updated. Thank you KG.